As a parent you wonder how you will pick the best school for your child to attend? You have three choices as a parent; public, private or home schooling. Even if you are paying tuition for a school, the deciding factors are always important. 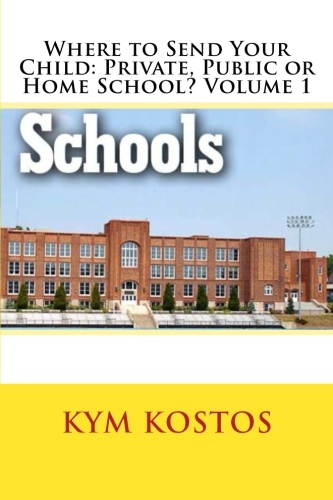 In Volume 1, I will go over the three types of schools, public, private and home school. I will break them down into sub-categories and explain each one to you and then go over the pros and cons of each type of school. Hopefully this information will help you in deciding what type of school you want to send your child to. If you're determined to have someone else teach your child, then the age long debate of private school or public school will cross your mind on more than one occasion. So many factors come into play when making this decision. One of them being finances. That is, your financial situation. Then of course deciding on what is best for your child. Some wonder how can we possibly compare two things that are so different? It’s like comparing night and day or oranges and apples. How can we compare two different things that are so obviously not held to the same standards? I went to private Catholic school for my years of education up until the ninth grade. My first eight years were a co-ed private Catholic school, then I attended an all-girls private Catholic school, then I went on to a public co-ed high school. I've seen the differences in the amount of education that is emphasized. When it comes down to it, you get what you pay for. It’s like buying a more expensive car. It looks better, runs better and is sharper and probably has more whistles and bells on it. But, if you go the economical way and buy a car that is not so expensive, it will still get you places where you want to go. Well, it all depends on how you go about doing it though. There are many public schools out there that offer the same kind of education that a private school would. Take into consideration the schools that offer honors courses or advanced placement courses. A lot of public high schools offer college prep courses. It depends on how serious you and your child will be taking their education and not just “go through the system” to get it over and done with. This is your child’s future you are talking about and it should mean the world to you.